The front desk staff were helpful in my eccentric desire for the discount cards to various attractions that were in the lobby. The restaurant staff were friendly and conversant my travels and interests. The beat customer service that we have ever had at a hotel. The staff went above and beyond!!! We loved the time we spent there. Breakfast was scrumptious with a wide choice of options. - Nice Brakfast. - Staff are cooperate and have wellcome smiling. The location was close to the airport and took about 15 minutes by the free shuttle. It is a standard hotel like any other with standard amenities. The beds were comfortable. Room was spacious and comfortable. Breakfast buffet was very good. Staff very pleasant. I was able to cancel our second night booking with no fee. Excellent reception, nice bar and staff. Comfortable bed and nice, big room. Free shuttle to the airport. 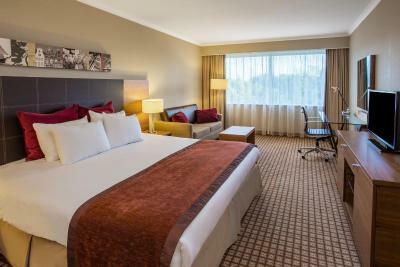 Crowne Plaza Amsterdam Airport This rating is a reflection of how the property compares to the industry standard when it comes to price, facilities and services available. It's based on a self-evaluation by the property. Use this rating to help choose your stay! 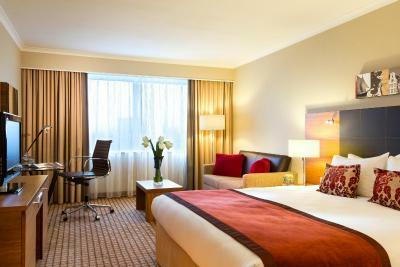 Crowne Plaza Amsterdam Schiphol is a luxurious 4-star hotel only a 10-minute drive from Amsterdam Airport Schiphol. This property offers a free Airport shuttle service. The rooms are stylish and comfortable. 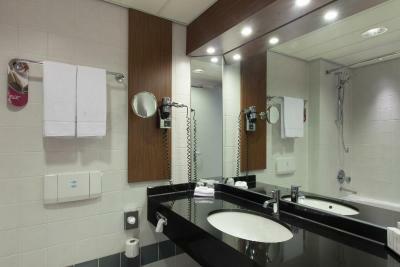 Each room has an private bathroom with a bath, a desk and coffee/tea facilities. 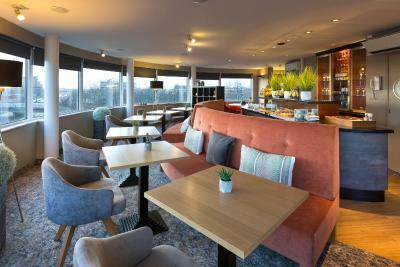 The Club room comes with Club Lounge access where guests can enjoy views over Schiphol area, free breakfast, drinks and snacks. Start your morning with a breakfast buffet, which offers plenty of tasty choices. The stylish restaurant will surprise you in the evening with fresh cuisine inspired by Dutch culinary traditions. Relax by getting a tan in the solarium or shape up in the fitness center. Located only a few miles from the A4 motorway, Crowne Plaza Amsterdam Schiphol enjoys easy access to Amsterdam and The Hague. The property offers free parking during the stay, no free long-parking. 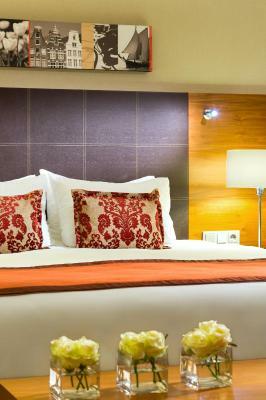 When would you like to stay at Crowne Plaza Amsterdam Airport? This suite offers a separate private lounge area. The Junior Suite comes with free Club Lounge access, where guests can enjoy all-day American breakfast and refreshments, afternoon tea and happy hour with alcoholic beverages. Recently refurbished air-conditioned room including free high speed Wi-Fi, bottle of water, coffee and tea maker, iron and ironing board and flat screen TV. Please note that bed preferences are upon request based on availability. Recently refurbished air-conditioned room with two double beds for up to 4 people including free high speed Wi-Fi, bottle of water, coffee and tea maker, iron and ironing board and flat screen TV. Comfortable air-conditioned Superior room including free high speed Wi-Fi, bottle of water, coffee and tea maker, iron and ironing board, flat screen TV, mini-bar and bathrobe. Comfortable air-conditioned Club room including free high speed Wi-Fi, breakfast, parking and access to our renewed Club Lounge where you can enjoy complimentary drinks and delicacies throughout the day and evening. Comfortable air-conditioned Superior room with one large bed and including free high speed Wi-Fi, bottle of water, coffee and tea maker, iron and ironing board, flat screen TV, mini-bar and bathrobe. Recently refurbished air-conditioned double room with sofa including free high speed Wi-Fi, bottle of water, coffee and tea maker, iron and ironing board and flat screen TV. Comfortable air-conditioned Superior room with two double beds for up to 4 people including free high speed Wi-Fi, bottle of water, coffee and tea maker, iron and ironing board, flat screen TV, mini-bar and bathrobe. Comfortable air-conditioned Club room with super-king size bed including free high speed Wi-Fi, breakfast, parking and access to our renewed Club Lounge where you can enjoy complimentary drinks and delicacies throughout the day and evening. Comfortable air-conditioned Superior room with super-king size bed including free high speed Wi-Fi, bottle of water, coffee and tea maker, iron and ironing board, flat screen TV, mini-bar and bathrobe. At the Crowne Plaza Amsterdam - Schiphol, our services facilitate your everyday life, propose you unique pleasures, allow you to play sports and secure your return. From pajamas on request to gym equipment brought to your room; we offer so much more! House Rules Crowne Plaza Amsterdam Airport takes special requests – add in the next step! Crowne Plaza Amsterdam Airport accepts these cards and reserves the right to temporarily hold an amount prior to arrival. There is a free shuttle service to and from the airport, every 40 minutes between 06:00 and midnight. Access from Schiphol very bad = 1 shuttle every 40mn ! Instead, why don't U communicate on the 10mn walking distance from Hoofdoorp station ? Easy to get to the train which took us straight into Amsterdam, very quiet location and friendly staff. Great location. 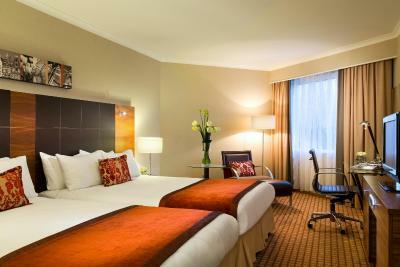 Spacious and well maintained rooms. The hotel is a bit run down, needs to be refreshed, renovated (furnitures, carpets heavily used, black fungus in a bathroom). Older looking hotel that could use an update. Noisy room with ambient noise, noise from traffic/train and noise from air condition. Water takes a long time to heat. Gym lacking. Nice size rooms, friendly staff, free bike rental always available. Good pillows. Convenient location. Good room to room noise isolation. Industrial type of location - although easy to reach. Hotel needs a renovation to bring it up to nowadays standards. The rooms and bathrooms need renovation, old Beaten up furniture.